Few months back, I wrote a post on how to sign and install unsigned Symbian applications. Due to two three months of inactivity and increased requests from my friends here, now I am again dealing with this topic. Like any Windows software, as a security measure, a mobile software should also be digitally signed to ensure that it’s safe to install on the target device. Digital signing should be done by software authors or by the users. In in most of the cases, a certificate is associated with genuine mobile software. Here we have few tips to sign unsigned mobile applications. There are three different methods to sign and install unsigned Symbian software. 1. Turn of the certificate checking feature in your mobile phone. 2. Install unsigned Symbian software using developer certificates from Symbian.com website. Symbian.com is place for mobile software developers where they get their applications digitally signed. Here you can upload your applications and download the signed versions that can be directly installed. But for registering at Symbian.com website, users need their own email address, that is something like username@userdomain.com They won’t accept Gmail, Yahoo and other normal email addresses. 3. Sign and install mobile software using existing certificate and key file: The third method is using a pre-created certificate and key file for local signing of unsigned Symbian mobile software This method needs three things. 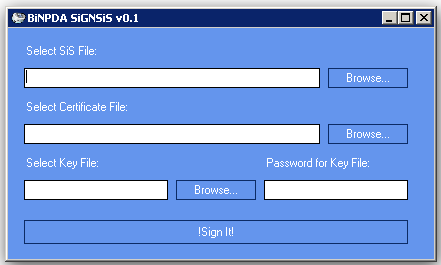 A certificate file, key file and signing software(Signsis.exe) . If have a certificate and key file , as shown above, you can sign any Symbian mobile software using SignSIS . Use Password for key file as 00000 . Now if your want Certificate and key file for your phone, just subscribe to mobiclue.com’s feed and then post your IMEI number and mobile phone information in comment box . Download SignSIS & sign Symbian Nokia mobile software . Please don’t publish your email and IMEI number here. Update: Checkout this article to download .CER and .KEY file and sign Symbian application for free. please send me the .cer file for my imei number. Thanks for the key and certificate file . Hi my name is Vishal. I want certificate & key file for my nokia 5320. I'll be very very very thankful to you…! pls can u send me key and certificate. help me pls.i have a nokia n82 mobile phone.pls pls send me a certificate & a key.i don't know how to get it.my imei no. 358984014986197 . my email number nildukkho@gmail.com .pls help me. Please send me the the certificate for installing unsinged applications. Please send me the the certificate. Hi there, please help me too. Please send me cer and key files! Hi, can you send me the cert please? can you please give me cer file? can you please give me cert and key file? Please send me the cert. and the key file. Thanks! Please send me the cert. and the key file. I need certiicate and keys to sign the unsigned files for S60V3 OP9.1x. Due to limited time and excessive requests , we are currently not providing certificates and key files to Sign and Install your unsigned Symbian mobile softwares . But soon we will add someone to our team so that he will fulfill your requirements . hi good day. hope to get the certificate and key file soon.my phone is N82 and the IMEI no. is 358082019303888. plz send those files to my email id as bineymaharjan@gmail.com. thank u so much.hope to see ya soon. Pease help me, i would really appreciate and never forget. I tried all possibilities to get my certificate and key for my nokia e52 but none works! hi can you send me the cert and key please? Can I please get the cert and key ? Plz send me the certificate and the key,Thank You in advance………..
hi dear plz tellme wht is tyhs u alll snd emie of handsets???? Hi, please can I get my Certificate and Key please. can i get certificate and key please. hi.. i need the key and cer.. pls help me..
i need the key and cer.. pls help me..
And phone is nokia e63. Need a cert and a key file. Has anyone actually received anything, I signed up ages ago and have not received the certificate and key file. I am wondering whether this is a con to obtain imei numbers! Please can you send me the certificate and valid key ? could you please send me the certificate and valid key ? please send the certificate and valid key. pleassssssse. give me a certificate and key for nokia n95. plz send me cer file and key asap…..
Thousands of thanks in advance! pls give my cer n key. Please send me the key and certificate file. please send it to ruiz.guayo.eduardo@gmail.com thank you!! please send me the correct certificate for my phone. i’m looking forward you reply..
want certificate and key file for my mobile.